Could your love relationships be better? If you're ready to start receiving the type of love you've always wanted, More Love, More Joy! 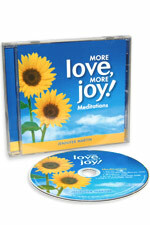 can help you create the most balanced, healthy, and mutually enjoyable relationships possible. Imagine if your sweetheart gave you the ideal birthday gifts, took you out on per fect dates, and understood the best ways to support you after a difficult day. If this sounds too good to be true, it doesn't have to be! By learning how to communicate more effectively and aligning your inner self with your desires, you'll be able to experience happier, more fulfilling relationships than you've ever had before. Inside this book you'll find inspiring stories, practical communication strategies, guided meditations, and thought-provoking exercises that you can do on your own, with a partner, or in a peer hosted group. Create more fulfilling, joyful, and balanced relationships. Communicate your needs and desires easily and effectively. Remove blocks that may prevent you from receiving what you want. Create your Wishbook, an instruction manual that will help your partner understand how to care for you in the ways you've always wanted. Greatly reduce the stress and guesswork in your love life. Increase your likelihood of success in all interpersonal interactions. 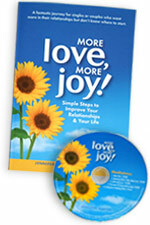 If you'd like MORE LOVE and MORE JOY in your life, begin this empowering process today! If you haven't signed up yet as a member, click on the "Sign Up!" link below the Member Login section on the left-hand side of this page. Membership is FREE! 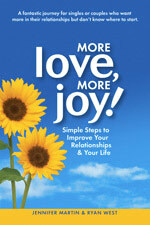 Once you are logged in, click on the link below to download the first chapter of More Love, More Joy!